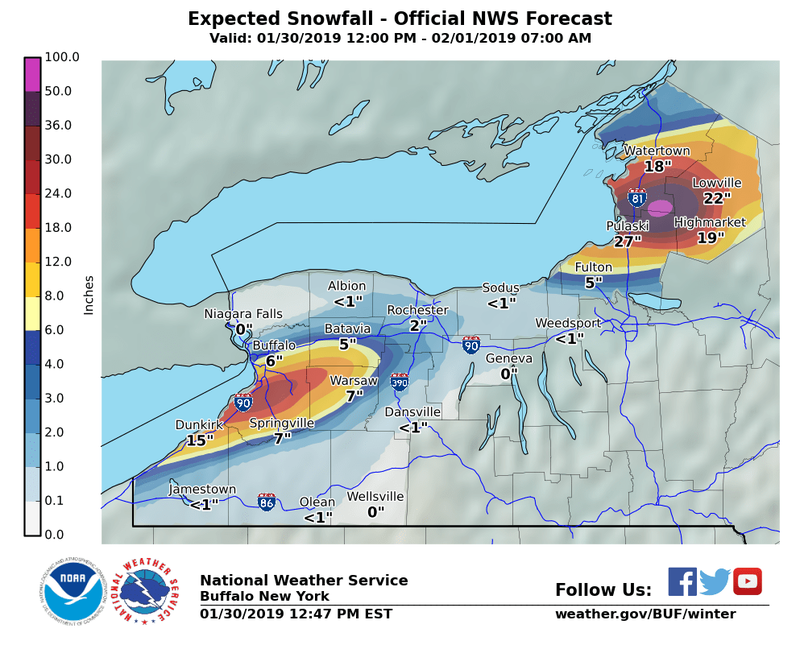 A blizzard warning that was in effect for Jefferson and Lewis counties has expired, but winter storm warnings remain in effect for Oswego, Jefferson and Lewis counties until Friday morning, and a wind chill warning is in effect for all of central and northern New York through Thursday evening. Temperatures early Thursday could be as low as -10, with wind chills as low as -30. Because of the frigid temperatures and lake effect snow, a number of schools have already closed or delayed on Thursday morning. Onondaga County - in effect until 10 a.m. Thursday. Lewis County - no unnecessary travel advisory until further notice. Around central New York, there won't be much snow to talk about, but it will be extremely cold. Temperatures in the Syracuse area are expected to drop to -5 by early Thursday, with wind chills as low as -25. But across parts of northern New York, several feet of snow is expected between Wednesday afternoon and Friday morning. "Travel could be very difficult to impossible. Widespread blowing snow could significantly reduce visibility. The hazardous conditions could impact the morning or evening commute. The cold wind chills could cause frostbite on exposed skin in as little as 30 minutes," according to the National Weather Service. 3-5 feet of lake effect snow could fall across parts of northern Oswego, Jefferson and Lewis counties by Friday morning. Travel is expected to be treacherous around the region over the next few days. Gov. Andrew Cuomo's office has banned large trucks and buses from the New York State Thruway from Rochester to the Pennsylvania state line, and in I-81 from the Mexico exit to the Canadian border. Police and local officials say if you have to go out, to use extreme caution, and make sure all of your windows and lights are cleared of snow.